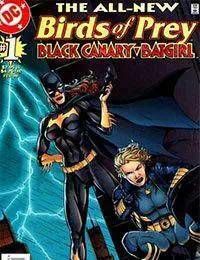 Presenting the all-new team of Black Canary and... Batgirl!? Barbara Gordon, back in the cape and pointy ears, is once again fighting crime around Gotham City, facing a sinister plot that begins with the Mad Hatter and ends with every villain in Arkham Asylum. But if she isnt crippled and this isnt a dream -- and it most definitely is not -- how do you explain it? [ Solicited as Birds of Prey: Batgirl #1 ].